But all I have is cards... darn! Here is another card from the fun filled swap I did with two ladies at work.. so we could get our juices flowing and get some rubber burning!!! 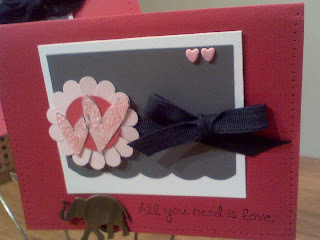 I was trying to also get rid of some scraps that were scalloped grey and then i wanted to use the "ALL YOU NEED IS LOVE" stamp (which didn't photograph well). 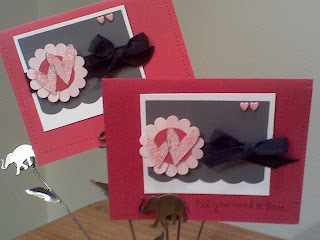 Then I used the piercing tool to make a border the entire way around the card. I wanted to use the accordian flower that is shown in the Sale a bration, but instead I used the scalloped circle cut to look like a flower. Sometime soon I will get the accordian flower perfected.... sometime!